This 2-CD live album called ‘The Curse of the Antichrist – Live in Agony’ has turned out to be one hell of a statement for DESTRUCTION. – They are alive and well and they thrash like there’s no tomorrow, of course. This 2-CD album is recorded live in Wacken in 2007 and from a tour in <?xml:namespace prefix = st1 ns = "urn:schemas-microsoft-com:office:smarttags" />Asia if I’m correct. The band is joined on stage of several guests such as; Bobby “Blitz” from OVERKILL, Oddleif Stensland from COMMUNIC, Peavy from RAGE and former members of DESTRUCTION. We are treated with songs such as; “The Butcher strikes Back”, “Mad Butcher”, the fantastic “Thrash Till Death”, “Unconscious Ruins”, “Death Trap”, “Metal Discharge” and many more. It all ends with a favourite of mine namely the awesome; “Bestial Invasion”. 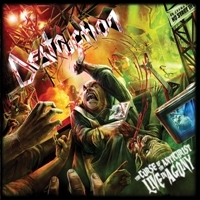 DESTRUCTION is in excellent shape and any self respecting thrasher should definitely at least give this 2-CD set a listen.